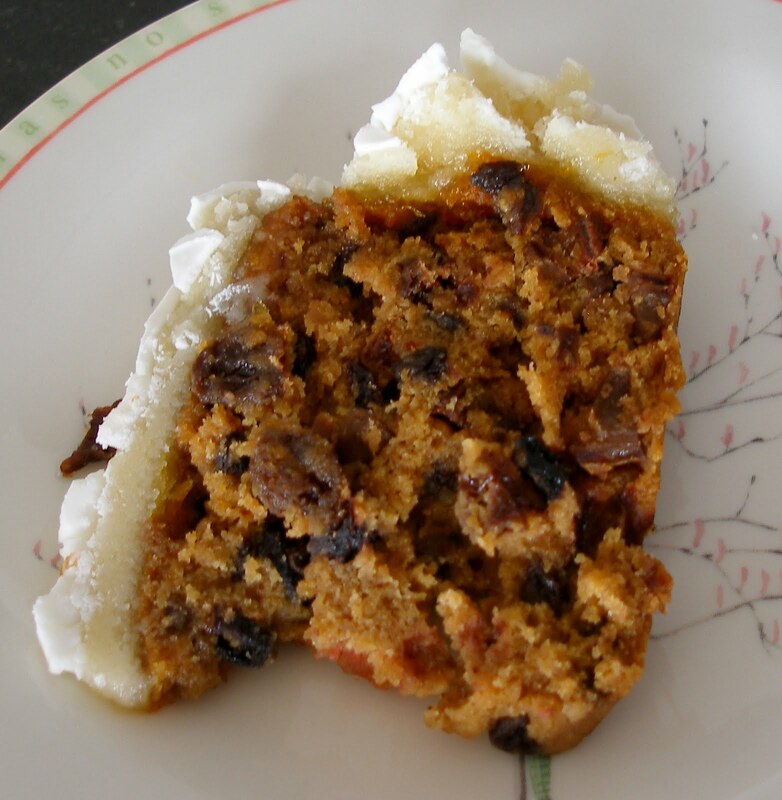 I love Christmas cake, mince pies, Christmas pudding and all the yummy treats of the festive season. When I lived in UK everything I ever wanted to indulge in was one delicatessen away but here in Nairobi specialised foods are sometimes hard to find and if you do manage to get something, it’s usually way too expensive. I came across this very easy to make cake and it turned out rather well so I’m sharing the recipe with you. You will need a square 18cm tin to make the cake. 1-2 tbp bourbon or any other booze you have at hand. Alternatively buy a miniature bottle. ■ Preheat the oven to 180°C, fan 160°C, gas 4 and line a square 18cm tin with nonstick baking paper. Put the butter in a large bowl. Bring the sugar, maple syrup, soured cream and spice to the boil in a pan and pour over the butter. Stir until melted. ■ Beat in the eggs one by one and add the orange extract. Stir in dried fruit, cherries and almonds. Sift in the flour and bicarbonate of soda and mix well. ■ Spoon the mixture into the tin and bake for 1 hour 30 minutes until the centre is cooked and a skewer comes out clean. Leave in the tin until warm, then drizzle a little of the bourbon over the top; leave until cold. Brush with more bourbon, remove from the tin and wrap well to store. ■ For the icing, beat the ingredients in a large bowl with an electric hand whisk until light and fluffy. Then spread on top of the cake. Ice it just before serving it up on Christmas Day. Sometimes I feel the icing gets too much so I omit that and just dust the top of the cake with icing sugar and slice. Tastes yummy with a steaming hot mug of Earl Grey tea.